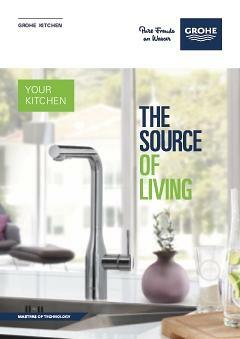 The GROHE Minta single-lever mixer tap delivers on design while bringing professional performance to your kitchen. Flexible and powerful, its distinctive silhouette will enhance a contemporary design. Everything about the tap makes life easier, starting with being swift and simple to fit thanks to the Easy Installation System. Ease and convenience are essential in any kitchen, so the Minta kitchen mixer features an L-shaped high spout that can turn through a full 360˚. A pull-down shower head with two spray options to helps complete a multitude of kitchen tasks with ease, from filling pots to cleaning up, but also makes it an ideal, flexible choice for a double sink too. When you are finished the GROHE EasyDock system also means that the spray head retracts back into place effortlessly. Cleaning is easy too, with the SpeedClean silicone spray nozzles that can be cleared of limescale with a brush of your finger. Take peace of mind from the GROHE SilkMove feature that guarantees life-long smooth and accurate water and temperature control. The sparkling GROHE StarLight chrome finish is scratch-resistant for a durable, pristine surface.